Equipped for just about any production environment. 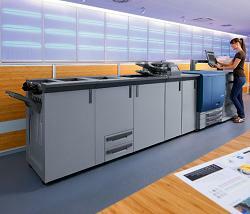 The PRESS C6000 has raised the standard in color printing. The PRESS C6000 digital color press combines high quality, low cost and outstanding customer satisfaction. With the ability to output up to 60 high-quality color pages per minute, you’ll have no problem delivering brilliant color jobs on-time and on budget. Optional GBC punching and 6 folding patterns. Three Custom-designed controller options to choose form (Konica Minolta ID-601 Image Controller, FIERY Controller, or CREO Image Controller).